I am college student so saving money is very important given my penchant for the high end. But what do you do when your hobby isn't for the average broke student? What I look for in most beauty products is efficacy and quality. I'm very picky when it comes to beauty products and even pickier when it comes to skin care. I personally like to test out beauty products before buying them, especially for items with a higher price tag. Continue reading to discover resources that can save you money big time! First things first, I recommend creating a wish list of products you would like to try and use the tips below to save money on those items. Sales are the first thing you should think about when it comes to saving money. Sale sections of websites are always available but if you are looking for greater discounts wait for sales that are qualified on all purchases. Keep in mind, many of those sales occur online and not in stores so keep on the lookout for deals around holidays such as Memorial Day, Thanksgiving, or Christmas. Also keep a lookout on company websites that promote deals such as Friends and Family Events or Anniversary sales. These companies promote such sales on social media sites such as Facebook and Instagram. So instead of scouring your favorite websites every couple of weeks for a deal, utilize social media networks to save yourself some cash and time. Not every website allows you to utilize coupons for a discount but you can use coupons to receive free samples or gifts. I personally shop Sephora for a majority of my beauty needs and sites such as RetailMeNot offer coupon codes that have awarded me deluxe samples such as Burberry, YSL, and Bare Mineral lippies and BUXOM eye shadows, as well as many more products. Just search the words "beauty coupons" in a search engine and find deals from your favorite websites that you won't be able to find anywhere else. Loyalty has its perks. You can save even more money instantly by signing up for brand loyalty programs. Cosmetic companies such as MAC and Sephora have loyalty programs which give you automatic discount codes once you join. Dermstore provides 20% off coupons for every purchase you make and I use these to my advantage to re-up on staple products until I can wait for new sales. Currently they are having a winter sale so head on over and see what they have to offer. My favorite way to save money is by paying less and getting more. Value sets are a great resource if you're looking to try multiple products at once while also saving money. Value sets are great for those who are new to makeup and are uncertain about where to start. They're also perfect if you need to buy gifts for multiple people. You can distribute each product based on the person you need to gift and still have some money left over to treat yourself. Recently, I have found a new favorite moisturizer from the Caudalie Vinosource Thirst Quenching Saviors Set. Not only did I save money by getting multiple products through this value set, I also saved money by purchasing it during the Sephora VIB sale. I discovered a moisturizer that is rich enough for my taste but also doesn't cause my face to break out. I also found an alternative to my former favorite facial spray, MAC's Fix+. Caudalie's Grape Water facial mist is almost half the price of FIX+ with double the amount of product and lasts me twice as long. It is also comprised of 100% organic grape water which is great for my sensitive skin. If you would like a review on the Caudalie Vinosource Value Set leave a comment below. If you are a make-up artist or an beauty student don't miss out on the special perks available only to you. Many big beauty retailers offer artist and student discounts so you can supply your kit. You can apply to these perk programs online at each retailer's website or visit a site I have recently become aware of, Frend's Beauty. It offers discounts on many beauty and hair care brands instead of having to sign up for each retailer's perk program. Through their Frends with Benefits program make-up artists, students, estheticians, and cosmetologists can save up to 40% off on brands such as Beautyblender, Viseart, Anastasia Beverly Hills and much more! If you're just a regular customer you can save up to 10% off by signing up for the program. Not a pro but looking for the same savings? Check out local outlets for great discounts on products that never sold out. Outlets are great if you are looking for products that were limited edition or discontinued. Check out blog sales for great bargains as well. Not all products posted on blog sales are used if you are concerned about cleanliness. Some were just purchased, never used, and either weren't or could not be returned. If you are to wary to sort through the blog sales check out All Cosmetics Wholesale. All Cosmetics Wholesale is a website where you can buy products from big brands for whole sale price! Not only do they offer products that you can usually find in drug stores, they also sell big name brands such as Bobbi Brown, MAC, Burberry, Kevyn Aucoin, Stila, and YSL to name a few. And of course they have many products from my go to beauty fave NARS. A tip for shopping on ACW: read the description. All of the products are new but read the description to make sure that the item is truly what you're looking for. A majority of the products posted on ACW are final sale and can also be un-utilized testers. If you're not into that and want your items to be fully sealed then avoid those items. The state of the product and/or its Final Sale status is usually listed in the description. If samples are not available travel sizes are the best next thing. Look for mini or travel sizes in stores. They are usually found near or around the purchasing counter. You can use them to test out new products and can also take them on trips to save space in your luggage. When searching online, click on the item you want to buy and see if it can be purchased in multiple sizes including jumbo sizes. You save more by sizing up. Ultimately, the greatest tip I can offer you is do not get caught up in the hype of what is new and trendy. 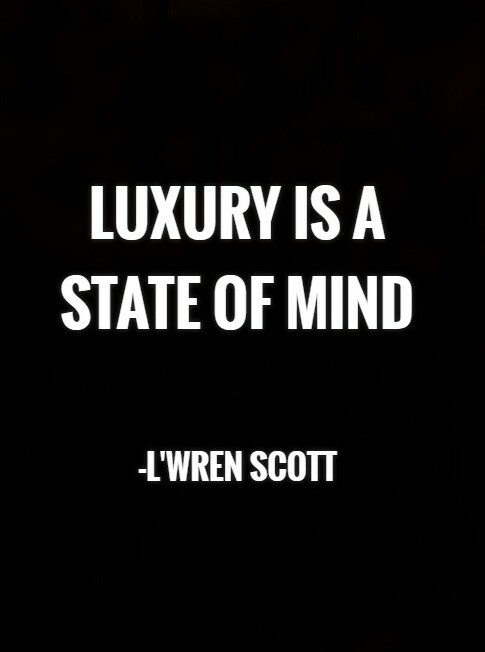 Save your money and purchase what you truly want and need so you will come to enjoy your products instead of regretting their purchase. Don't get out of control because there is a difference between being a beauty enthusiast and a beauty junkie. Over the years I have overcome a sort of shopping addiction and the thrill of buying a new product is no longer worth it to me if I can't see my way through the "things" that I've bought. So to end this post I would like to say that luxury is not a state of being, it is a state of mind. Don't sacrifice your personal peace to appease a temporary impulse. My new thrill? Finding staples products that I can count on and saving a buck or ten while I'm at it! Do you have any tried and true resources I didn't list above? Comment below and help your fellows beauty enthusiasts get more for less! Choosing to wear a bold metallic eye shadow can be a bit intimidating. Even still don't reserve bold shades such as silver for only special occasions and holidays. Here are three ways to wear it for everyday. 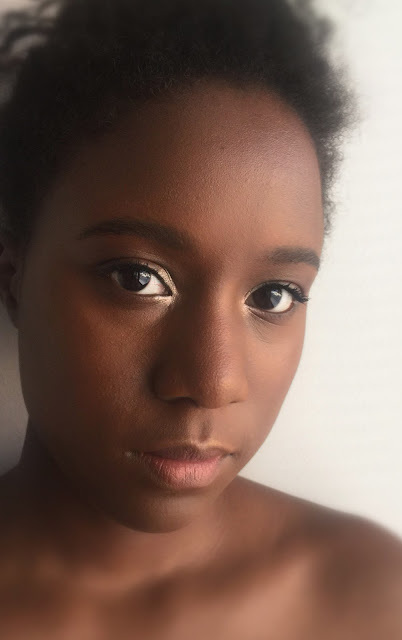 For this look, you'll want to keep your base make up clean and fresh. Apply foundation only where it is needed along with a blush and highlighter that will leave your skin looking radiant but natural. I filled in the sparse areas of my eyebrows and used a bit of brow gel to keep my brows looking groomed. I also kept this look fresh by forgoing lipstick and applying a rosy pink lip balm to liven up the my face a bit more. Then, I focused the application of a bright silver eye shadow on the inner quarter of the upper and lower eyelids to brighten and maintain focus on the eyes. Finally, apply mascara to the upper lashes and you're done! Now this application method can work for everyday or a special occasion. This look is not about standing out, it's about complementing your best feature, the eyes. I started this look off with the same base application as the runway inspired look but I added a bit more blush and dabbed pink lipstick onto my lips. I defined my eyebrows a bit more and also loaded on more mascara. I used a neutral brown in my crease area and lower lash line before applying a gunmetal shadow all over the upper eyelid. I then applied a bright silver shadow to the center of the eyelids and the inner corner of the eyes. 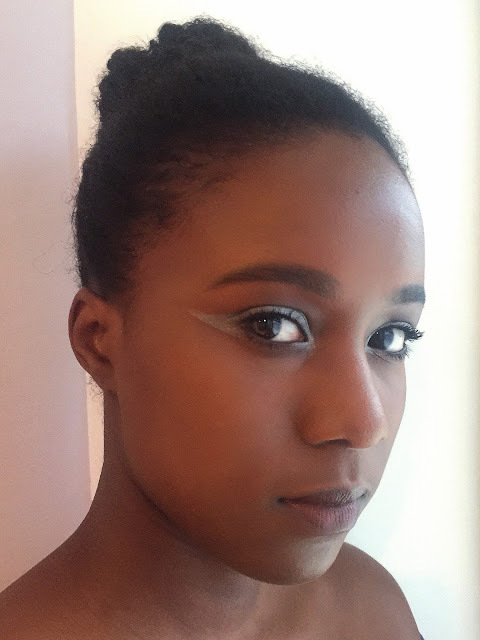 Finish off with winged eyeliner to ground and lengthen the eye. Keep your look wearable by focusing on your eyes. Don’t let any other feature on compete at the risk of looking too made up. 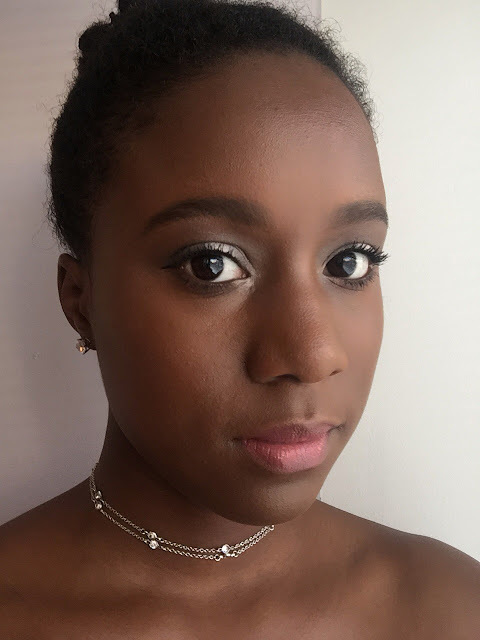 For this look you can keep the same base as the classic eye shadow look but add a darker berry or brown lip stick to complement the strong silver wing. To achieve this look use tape to help create a sharp wing and pack a gunmetal eye shadow all over the eyelid and extend it as far as you like. Also apply the same eye shadow to the inner corner of the eye and lightly onto the lower lash line. You don't have to extend the winged shadow as much as I did. To make it more wearable just shorten the wing and pack on the mascara. When I saw these holiday sets online I immediately had the childish thought of “I want it and I want it now.” The gold packaging with detailing mimicking precious gems was so beautiful. The patterns reminded me of deep red rubies and sparkling diamonds worn in the crowns of royalty. 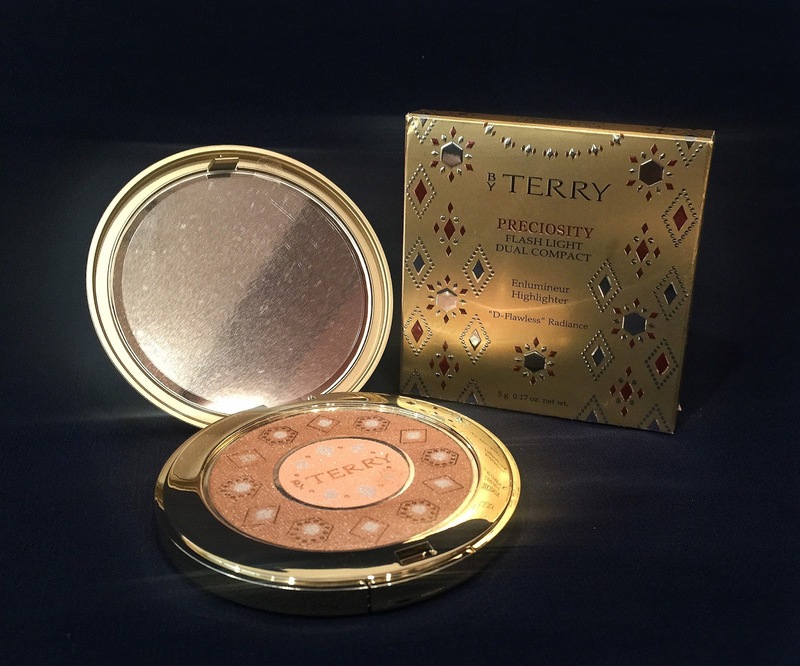 BY TERRY is a brand whose products I have always wanted to try, but the prices of the brand’s makeup seemed monetarily overpriced for me to purchase from a brand I had never got to sample. I ordered these items during Dermstore’s 20% off Black Friday sale and I was happy that I would get to try many products from the line at a better value. When I received the items, I was slightly disappointed. The outer packaging of the items was very cheap in look and feel and gave me the impression that a child in the fifth grade made a holiday design out of craft paper and cut out geometric shapes. None the less, I was still excited for the goodies inside. Unfortunately, I was again disappointed with the primary packaging of a majority of the products. Although the appearance of the eye shadow compact is elegant it is made of lightweight plastic which is not something that I prefer in a compact. I am more used to higher end products having a heavier feel that I personally equate with the higher price tag. Unfortunately, I do not feel like this eye shadow compact gives off luxury vibes just from appearance alone even with the iconic BY TERRY logo etched into the front of the compact. Also, the packaging just doesn’t make sense to me. The palette is equipped with an appropriately sized mirror and comes with a brush but the palette does not have a slot to store the brush within the compact. Initially, I internally tried to justify the item’s weight to be intentionally light for travel purposes, but if there is no compartment for the storage of the brush then it makes no sense that you would carry this compact with you on a night out. It seems like the brush may have been thrown in with the set to appease consumers who expect such items with a luxury holiday eye shadow set. While on the subject of the brush I would also like to note that it is dual ended and made up of what I believe to be synthetic bristles. One end is in the style of a fluffy eye shadow brush that can be used for blending or packing on eye shadow. The other end is stiff and cut at an angle so it can be used for purposes such as applying the eye shadow as liner or for more defined detail work. I would like to say that the bristles are soft (even after washing) and that overall I like the brush more than I like the eye shadows. The eye shadows inside the compact are not anything like I was expecting. I found that each eye shadow was powdery, sheer, and that they all kicked up a lot of dust. I guess that is to be expected as the description of the eye shadows is states that they are ultra soft and build-able. I found this ultra-soft formula was not my cup of tea. As I was applying the matte eye shadows it was very easy to blend the pigments away into nothing even when using an eye shadow primer.You can build on the colors but you kind of must if you have a darker skin tone otherwise the eye shadows will just fade away. 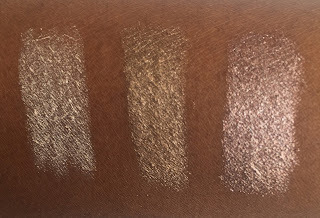 Also, if you are my skin tone or darker you will only be able to use three out of the six eye shadows in the palette. 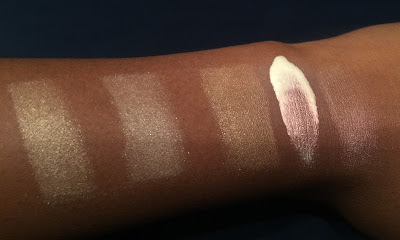 The two light creamy shades that are meant to be a brow bone highlight or crease color are much too pale and chalky to be wearable on deeper skin tones. The dark grey furthest to the right is difficult to wear on an everyday basis and is not a flattering shade for someone of my skin tone. The only use I could get out of it was a grey smokey eye which I do not do often. The only shades that are wearable on my skin tone is the dark brown eye shadow and the two shimmer shadows. Even still, the shimmer shades essentially looked the same once applied onto my eye lid. All in all, I would not recommend this eye shadow palette if you are of a darker complexion but if you have a lighter skin tone I think that you would enjoy this palette more than I did. The color palette is essentially neutral and the eye shadows can be sheered out for a light, natural makeup look for school or work or built up for a night time glam or smokey eye look as well. WOW! Don't be fooled by the beautiful photos seen online because this packaging is cheap! BY TERRY might want to send me a cease and desist because I’m about to go in! Seriously! My jaw dropped to realize that I had been bamboozled out of $52.00 for a highlighter with packaging that shouldn’t even come from a drugstore. I don’t expect packaging like this from dollar brands like E.L.F. so I do not want it from a luxury brand that gets glowing reviews from beauty bloggers and YouTubers around the globe. Upon just holding the compact I was ready to send everything back to Dermstore but I knew I had to write this review. Honestly there is no justification for this highlighter to be as expensive as it is and to be made so cheaply. The compact is extremely lightweight and comprised of golden colored plastic that I see in children's toys. Also, everytime I open the compact it CREAKKKSSS like a child’s make up compact. It sends shivers down my spine. The front of the compact has a sticker slapped onto the front with the same preciosity holiday design printed on it that initially caught my eye. Now the design was hurting my eyes while the value was hurting my heart! All dramatics aside my initial thought was HOW DARE YOU! This compact has to have the worst packaging I have ever seen from a beauty product and honestly had I seen this in person I would never have purchased it or even looked at it twice! But…I am keeping it…because the highlighter is beautiful. As I found with the eye shadows the highlighter kicked up a lot of powder with a brush so I had to use a light hand and just a touch to apply the highlighter. Both shades are pigment packed but despite that it is difficult to go overboard with this highlighter. I don’t find it to be too bright but the highlighter gives off a wonderful luminous radiance to the areas on which it is applied. The outer ring is a lovely rosy bronze color while the inner ring is a brighter glowing white shade. The powder is finely milled and both colors reflect silver and pink shimmers that are so soft. You will literally glow! This highlighter is so flattering that I almost forgot I hate the packaging. Almost. This highlighter is so unique to my collection that I decided to keep it because it is the type of highlighter that I believe every girl deserves. I can wear either shade alone depending on the look I’m going for or I can blend them together for a natural, radiant highlight that just glides over the skin. I did not find that this highlighter accentuated pores or textured skin but it did make my cheeks look so smooth. I would love to wear the bronze shade for a summer time highlight but it is currently winter in my region. Either way I’m in love even though every time I open the compact I wish it was designed by someone with the quality of mind of BECCA’s or Hourglass’s artists. All in all, the packaging on this product is a real miss but luckily highlighter is something I have never experiened. As I found with the rest of the preciosity packaging, the packaging of the Preciosity Flash Light Elixir Highlighter is cheap and poorly executed. The liquid highlighter is dispensed in a dropper style bottle in which the opening of the bottle is much larger than the dropper. There is no guard to guide the dropper back into the bottle so you must be careful when inserting the dropper back into the container so that the liquid highlighter does not catch on the lip of the bottle and slide down the neck. Also, not to beat a dead horse but the golden textured finish of the bottle and metallic dropper feels like it is comprised of cheap, thin aluminum! I have to reiterate this because by the time I tried this highlighter I was floored by how the price did not reflect in the products overall. There are brands that have much lower price points that manage to deliver great products as well as hit the mark on packaging and I was and am very disappointed that I can’t be proud to show off these products so to speak. skin as well as light skin! I did find that the highlighter lightened my foundation if I accidentally applied too many drops so one or two drops is enough. Also, if you are using a matte foundation you will want to use maybe one drop of this highlighter and mix in a beauty oil or else you will have dry looking skin because the mixture will settle into fine lines. This liquid elixir is beautiful and easy to work with but it dries down to a powder like consistency which I believe contributed to it drying out with my mattifying foundation. I used the Fenty Beauty foundation with this highlighter and I did have to wear a smoothing primer and still mix in the beauty oil for a smooth application. This highlighter is a winner in my book! While these cream eye shadows are ridiculous in price they are also ridiculous in pigment and staying power! Also, this is the first product I found that gave me a luxury look with luxury packaging! Hallelujah! The metallic gold packaging and black lettering is classy and smart. I appreciate that there is a band around the base of the eye shadow stick that showcases the shade inside so you won’t have to take off the cap to see what color you’re getting. This set comes with three cream eye shadows in stick form, No. 3 Blond Opal, No. 4 Bronze Moon, and No. 5 Misty Rock. Each one is smooth upon application and bulletproof once they set. I actually had a hard time removing them all with only a makeup wipe. catcher. Each shadow blends out nicely while they are still creamy but I noticed that if I over applied the cream shadows in a thicker layer they did crease in the hood of my eye. I recommend using one layer and you won’t see creasing once the shadows set. I also noticed that Misty Rock and Blond Opal flaked if disturbed while they were setting so once you blend the shadows out leave them be. You don’t have to layer them to get the full effect so let the shadows do the work for you and sit back and look gorgeous. This set comes with three Velvet Rouge liquid lipsticks in the shades Cappuccino Pause, Bohemian Plum, and My Red. The colors are described, in order, as a dusty rose, deep red wine, and a classic red. I believe that the description of the colors is accurate. Each color goes on smooth like a highly pigmented gloss but they are essentially liquid lipsticks that don’t dry to that cakey matte finish that many tend to associate with liquid lipsticks. 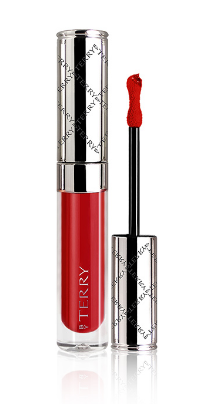 Each liquid lipstick is highly pigmented with one swipe application and dries down to a satin finish. They aren’t transfer proof but they are pigmented and long wearing as most liquid lipsticks are. The packaging gets a 5/5 and I love the applicator. Before using these I had never seen an applicator so unique. 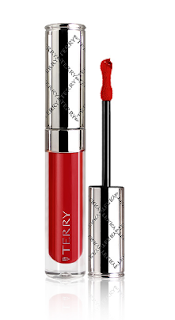 The shape is like an hourglass with a rounded tip that is great for getting a smooth even edge and the dip in the shape collects pigment and deposits it evenly across the lips. 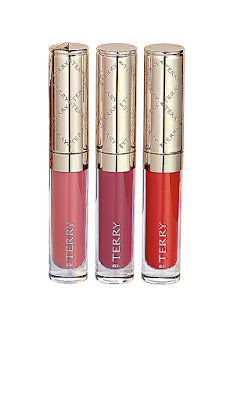 Pretty much as soon as I had tried these lipsticks I saw the advertisement for the Fenty Stunna Liquid Lipstick and the applicator is similar on the Fenty product if not the same as the applicator on the BY TERRY Velvet Rouge. Rihanna is smart to take inspiration from this applicator because I really prefer it compared to a standard doe foot applicator. This is another set I would highly recommend you buy as a gift for yourself or even a fancy stocking stuffer. I can’t see how anyone would be disappointed in the formula and I could seriously stare at the packaging all day. So pretty. If you are interested in acquiring any of the products mentioned in this review, you can purchase them at online retailers such as Dermstore, BY TERRY, Beautylish, BeautyHabit, and many other retailers. I have a habit of collecting high end luxury beauty products. It would be a shame if I didn't share my little pieces of joy with other beauty enthusiasts.